Takeaway: You’re already on your phone for a good amount of the day. Try downloading some of these apps to actually meet and improve your fitness goals! You’d be surprised at the ease-of-use for most of these apps. In the digital world in which we live, fitness and technology have never been more intertwined. There is no better way to stay organized and on top of your fitness goals than through some of the best workout apps. Often we underestimate just how much an app can improve our quality of life. Research shows that individuals who use workout and fitness apps tend to be more active and motivated than non-users. Whether you’re looking to shed a few pounds, tone up or simply maintain an active lifestyle, your smartphone makes the ultimate workout companion. We’ve compiled a list of the best workout apps based on a variety of features and fitness goals. 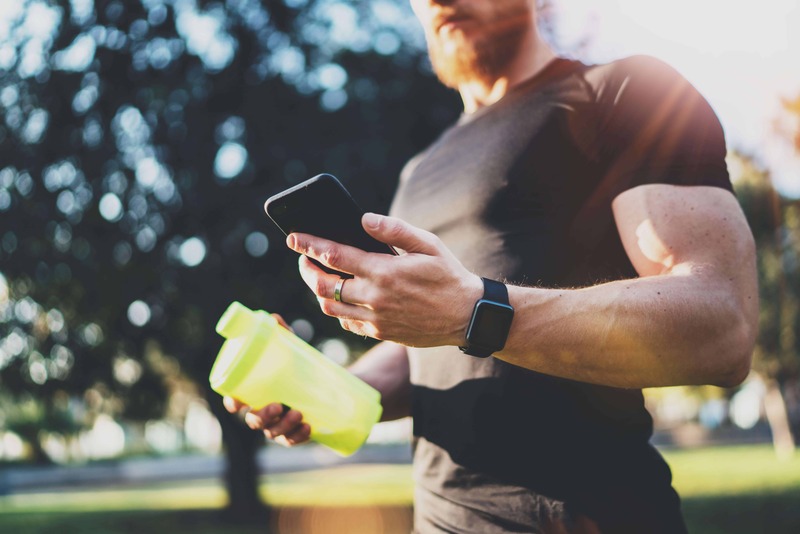 These apps aim to help users stay fit and improve exercise habits in an organized, convenient, and time-efficient manner. With everything from strength training and yoga to endurance and running, you will find the best workout apps to complement your exercise needs here. With over 185+ free workouts, Nike’s innovative and comprehensive app has made it to the top of our best workout apps recommendation list. Whether you’re looking to improve endurance, strength, or mobility, Nike’s got you covered. Start training today with a personalized workout plan that guides your progress, receive expert tips from top trainers, stay motivated by some of your favorite celebrity athletes with their inspired workouts, and switch things up with the different workout duration times available. Join the thousands of beginners who have successfully run their first 5K race! All you have to do is dedicate 30 minutes a day, three days a week for nine weeks to achieve success and cross that finish line. Start by selecting your interactive, motivating coach, share your progress with Facebook friends, and connect to the Couch to 5K’s supportive community of beginning runners just like you. Monitor both your distance and pace to analyze your performance as you improve. This user-friendly app is continuously cited as one of the best fitness apps because of its ease of use. MyFitnessPal’s database features more than 5 million food products, barcode nutrition scanner, and a recipe importer. Balance your calories on a daily basis by tracking meals, snacks, and exercise. Whether you want to lose weight, tone up, get healthy, change habits, or start a new diet MyFitnessPal will help you meet your health and fitness needs. Centered around HIIT (high-intensity interval training), Freeletics offers a variety of workouts to help users lose weight, build muscle or just get in better shape. This app revolves around four categories: Gym, Bodyweight Workouts and Training, Nutrition, and Running. Join the community of over 29 million users who enjoy over 900+ no-equipment-needed workout variations. Freeletics provides tutorial videos to help you train right at both beginner and advanced athlete level. You can opt to pay to gain access to a coach and personalized training. Cited as the best workout app for people who have felt too busy to get in shape, Sworkit allows you to determine both the type of workout you’re looking to perform and the amount of time you wish to complete it in. Its simple system offers great workouts for those who know what areas they want to improve. Workout options include strength, cardio, yoga or stretching, and the durations range from five minutes to an hour. By choosing to upgrade, Sworkit allows you to set the number of reps you want to complete and the areas you want to focus heavily on. The world’s first community-based fitness app that started as a basic workplace wellness program is now one of the best free workout apps available to users who want to be more active. Create and find “packs” to play with, download training plans for 5Ks, 10Ks, etc., and share your success with family and friends through this interactive app. Enjoy personalized or group Tabata-based interval workouts and group training with in-app coaching. Get fit and have fun doing it with daily workouts through the Daily Burn app. This YouTube-like app offers 500+ workout videos brought to you by expert trainers making it one of the best fitness apps for both iOS and Android. All 20 fitness programs can be streamed to Apple TV, Roku, Fire TV, Chromecast, Android, iPad, iPhone, iPod, laptop or desktop. Chose from high-intensity cardio to yoga whether you’re at home or on the go. Daily Yoga is ranked as one of the best workout apps for true yoga beginners who wish to advance. Packed with high definition videos for young Yogis, this app explores alternatives way to stay fit and provides health benefits for both your mind and body. Daily Yoga offers 500+ asanas, 200+ guided classes of yoga, pilates, meditation, workout plans, and top coaches’ workshops that suit yogis from beginner to advanced. All routines are under 30 minutes, and each session is categorized according to the body part you want to focus on. Challenge yourself to workout for just seven minutes for a full seven months with this no-equipment-needed fitness app. Seven’s workouts are based on scientific studies to provide maximum results in the shortest amount of time possible. With their user-friendly interphase, all you have to do is set your goal and fitness level, and Seven will take care of the rest. Keep in mind, however, that missing three days in one month will reset your progress to zero, so it’s important to stay consistent! If you would like to earn corporate sponsorships for charity whenever you walk, run or bike than put Charity Miles at the top of your best free workout apps list. This app pays you for the distance you’ve traveled! Earn 10 cents per mile for cyclists and 25 cents per mile for walkers and runners. You can then choose the charity you would like your money earned to go towards. Some options include Feeding America, Habitat for Humanity, Wounded Warrior Project and many more. Whether you like working out at home or lifting weights at the gym, Workout Trainer has you covered with over 1000 intense workouts ranging from five to 15 minutes. Each workout comes with step-by-step audio and video instructions to help guide you and succeed. This is one of the best workout apps out there because you can actually build your own custom routines and share them online, as well as access any of the community-created routines yourself. If you’re looking to improve your overall happiness and well-being, this is the app for you. The science-based activities and games offered can help with reducing stress, negative thoughts, and build greater resilience by providing the right tools and strategies for a better mindset. Pick your “track,” complete assessments, and implement them in your daily life. Mental stability is critical when it comes to achieving a healthier lifestyle. The classic calorie-counter that uses the proven principle of calorie tracking to help you succeed. Just enter your profile details, weight loss goals, and lose it! If nutrition and diet is your main priority, then this is one of the best fitness apps for you. The app will calculate the daily calorie expenditure that works best with your chosen health goals. You can choose from over 25+ macronutrient and health goals. If your fitness goals involve improving your strength, balance, posture, and flexibility than Pilates Workout Routines has you covered. This app focuses on not only strengthening your back, abdomen, and hips but also your full body flexibility and coordination. With a variety of routines and a step-by-step instructor, these pilates workout routines are suitable for both beginner and advanced users. An added bonus? You can stream these workout routines both online and offline! Does your work schedule make it difficult for you to attend a cycling class at the gym? CycleCast has got you covered! Choose from over 700+ indoor cycling workouts mixed with great music and motivation from professional instructors. Just select how much time you have, choose your instructor, and press play to start your workout! You may also sync and track workouts, calories, and your heart rate data with the Apple Health app. Rated as one of the best free workout apps for runners, this app is an instant classic. The GPS-enabled app logs your distance, time, and pace to generate easy to understand analytics. Whether your goal is pace, weight, or for a race, Runkeeper will coach you to reach it! Integrate your workout with your favorite tracks from Spotify or connect with other partner apps such as Fitbit, MyFitnessPal, and more. The most advanced interval training timer app right at your fingertips! Seconds is one of the best workout apps when it comes to quality, features, and ease of use. Create any interval imaginable with the custom timers that Seconds provides. Use templates for HIIT, Tabata, Circuit Training and more to get a head start on your workout routines. You can even send all data to your Apple Health app to calculate calorie expenditures. Cited by PC Magazine as being among the best fitness apps you’ll find, PEAR provides real-time personal training to reach your fitness goals faster than other workout apps out there. Experience interactive coaching from world-renowned athletes and learn how to train smarter, not harder. Workouts are suitable for all fitness levels and body types. You can also connect your Apple Health app stats to enhance your experience and keep track of your progress! If you’re all about group exercise than Aaptiv is among the best fitness apps for you. Get unlimited access to audio-only fitness classes led by certified personal instructors. With 2,500+ unique workouts in 12 categories and led by top-level trainers, you’ll never have to repeat a workout session. Pick your session, put your headphones on, and perform! 8fit is among the best workout apps for an at-home workout session. Enjoy quick routines combined with a simple, healthy meal planner customized to your needs. Adopt a healthy lifestyle, one session at a time. Use your body weight to build muscle strength, endurance, improve your cardiovascular fitness level and lose weight without losing muscle. Whether you’re training for a marathon or simply enjoy taking your bike out for a ride, turn your smartphone or GPS watch into a tracker with Strava. Record the distance you run, map out a cycling route and analyze your training with all the stats provided– for free! Use your Garmin, Fitbit or Polar with this app! You can also challenge yourself by picking routes that athletes near you have created, then seeing how well you perform and compare your results to theirs. This is among the best fitness apps if your goals are centered around strength training and bodybuilding. JEFIT will help you reach your strength, weight, fat loss, and training goals from beginner to advanced level lifting. Participate in a contest to stay motivated, share your goals with the support community, and benchmark against other users or gym buddy. If you own a Fitbit than this will definitely be one of the best fitness apps for you. Fitbit Coach will recommend exercises based on your daily activity tracked with a Fitbit device, providing personalized fitness guidance to better help you reach your goals. New workouts are constantly being added to keep things fun, fresh, and fit. Personalized video workouts show you the moves, and you’ll receive step-by-step coaching, motivation, and tips to help you stay committed to working out. For most of us, choosing the right playlist is just as important as selecting the right workout. It can be incredibly demotivating to listen to the same playlist over and over again. The entire Fit Radio team is dedicated to giving you new music, and new workouts every day guided by a coach. Get through your toughest workouts and stay motivated with the right song to compliment each move you make. One of the best workout apps for beginners new to lifting and for bodybuilders new to powerlifting-style routines. Complete five sets of five reps of five free-weight exercises in three 45-minute workouts per week. Strong 5×5 will graph your progress in a weekly or monthly view as you continuously log your progress in the app. An upgraded version of the app allows you to sync with your Apple Health app or Google Fit app for Android users. This is one of the best workout apps if you’ve invested in a personal trainer to reach your fitness goals. Use Trainerize to easily share your nutrition info and health stats with your personal trainer. Critical data like heart rate, weight, and food automatically sync from your Fitbit app to your trainer’s dashboard, so they can see your progress and keep you accountable. Achieve your goals by staying connected through your smartphone at all times! If you’re continually looking for the best on-the-go deals than MINDBODY is the best fitness app for you. Find the best fitness, wellness, and beauty services in your area. Whether you’re searching for a new spa or scheduling a workout, find and book classes or services where you want, and compare prices to find the one that works best for you. Squeeze in a great workout wherever, whenever with the ASICS fitness app. You’ll get unlimited access to audio circuit workouts for both strength training and cardio. All workout routines are led by personal trainers, backed by motivating music and guaranteed to make you sweat. If you own a good pair of earbuds, your smartphone, and have enough motivation to get you started then this is one of the best workout apps for you! Find success with the Gold’s AMP app that focuses solely on cardio and strength. All workouts are created by Gold’s Gym experts who coach and encourage you every step of the way. Just select the cardio machine you’re going to be using, the duration of your workout, and the intensity level. You also have the ability to set your own intervals and go faster with energetic mixes to get you moving.